The YN510EX is a TTL slave flash that works with both Canon and Nikon's advanced wireless systems. Are you such an avid off-camera lighting enthusiast that you want to ban new flashguns from your hotshoe? Yongnuo has something for you. The recently-announced Speedlite YN510EX is a flash that’ll cleverly receive advanced wireless TTL signals from both Nikon i-TTL and Canon E-TTL master controllers. But if you put this unit on top of your DSLR then it’ll offer you no clever features at all — not even basic TTL. 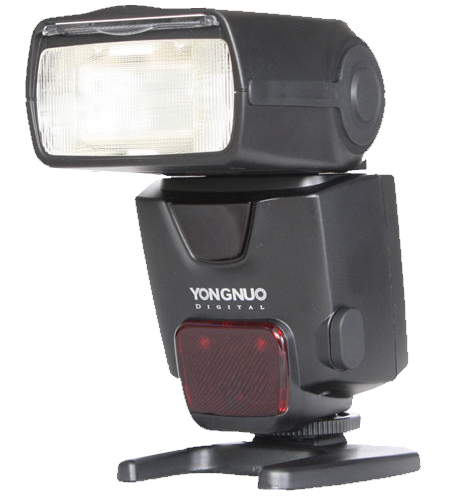 Unveiled to the public a couple of weeks ago, the Yongnuo YN510EX is now on sale, available on eBay for US$85 (about £57). In the US, Amazon.com is offering the flash for $89.99. Amazon UK also has it for £59.99. This device should appeal to photographers who already own an advanced wireless commander unit, like the Nikon SU-800, Canon ST-E2, Yongnuo YN568EX II or Yongnuo ST-E2. The YN510EX adds a slave flash to such a setup for an affordable price. As a non-dedicated flash (every 510EX works with both Canon and Nikon out of the box) it’s also brand agnostic: you can switch camera systems or lend a flash to a colleague without any compatibility issues. On paper, it might seem silly to get a flash such as this one when you can get all the same capabilities, plus support for on-camera TTL and high-speed sync (HSS), in the earlier Yongnuo YN500EX model. But then comes the price. By forgoing features in the hotshoe you are saving yourself a tidy $50. It’s a concept that’s been tried before in flashes like the Oloong SP660 II and Yongnuo’s own YN560EX, the latter of which is slightly larger and more powerful. The YN510EX is in fact so similar in feature set to the YN560EX that some retailers have started tagging it the “Mini 560EX“. Though neither has an input for an external battery pack, the two do have different manual sync ports (2.5mm vs. PC). But if you’re actually using them then you might be slightly missing the point of the product. For more information on the YN510EX, read the earlier announcement or visit the manufacturer’s product page.